An Air Cadet from Warton Squadron has become the first teenager ever to fly the RAF’s new Nimrod MRA4 Maritime Patrol Aircraft at an airfield in Lancashire. 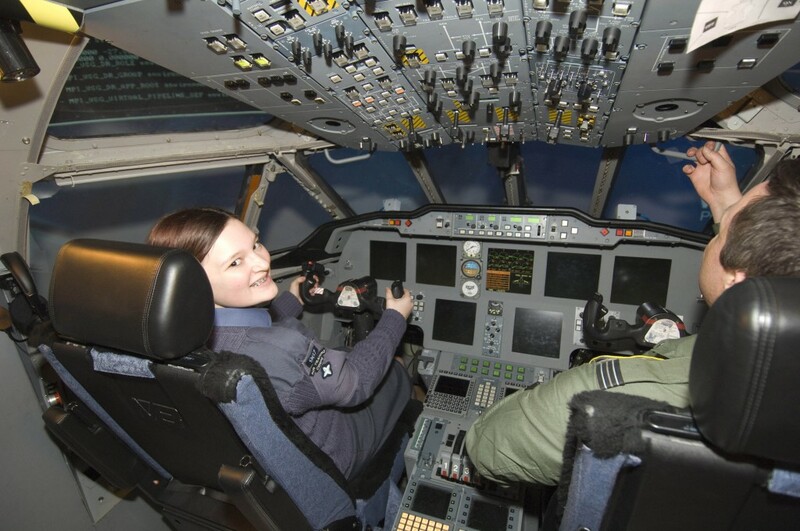 Laura Manning, aged 14 from Wesham, recently achieved this feat in the Nimrod Flight Deck Simulator at BAE Systems Warton site. Laura had this unique opportunity as a result of winning the 2007 ‘Squadron Cadet of the Year’ award at 967 (BAe Warton) Squadron in Warton. Laura was shown around the simulator by one of the Nimrod MRA4 Joint Trials Team pilots, Flight Lieutenant M Davies, and Mr Drew Steel MBE, Military Liaison Officer for BAE Systems. During her hour’s flight, Laura successfully piloted the simulator around the North of England before making three approaches back to Warton airfield. Laura has been a Cadet at Warton Squadron for just over 18 months, during which time she has been on Adventure Training Camps at Halton and Warcop training camps. Also through the ATC, Laura has participated in activities including Scuba Diving, kayaking, charity fundraising and a number of competitions. Laura was presented with her trophy in front of other members of the Squadron, parents and the commander of Cumbria and North Lancashire Air Cadets, Wing Commander Roy Anthony BSc GCGI MRAes RAFVR(T) by Mr Steel at the Squadron’s annual presentation evening held at Ribby Hall.